The Book of Perfectly Perilous Math: 24 Death-Defying Challenges for Young Mathematicians by Sean Connolly. Review: Math - a word that makes some kids scream will now make them break out in raucous laughter. Sean Connolly has written quite possibly the most valuable math book of the decade, The Book of Perfectly Perilous Math. Connolly has finally answered that age old question, "What does this math have to do with me?" In The Book of Perfectly Perilous Math, algebraic equations not only have purpose, but they are also fun! Included in The Book of Perfectly Perilous Math, there are "24 death-defying challenges." Topics that are so exciting for teens today (vampires and zombies) certainly find their way into a math problem. Also, a complete index of skills is included as well. Each challenge begins with a scenario that would quite possibly happen in real life, whatever data a mathematician would need to solve the problem, and graph worksheets for them to complete the challenge. It is a perfect accompaniment to any math student as well as any math teacher. There is one more bonus that must be mentioned as well - on the cover of the book, there is a warning that reads "CAUTION! These problems align with the Common Core Standards in mathematics." As a teacher who is trying to convert expectations to the Common Core, this book is invaluable. Connolly has also written The Book of Totally Irresponsible Science. We would like to thank Media Masters for providing a copy of The Book of Perfectly Perilous Math: 24 Death-Defying Challenges for Young Mathematicians for this review. 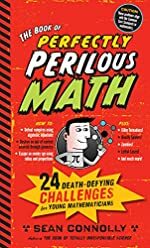 Have you read The Book of Perfectly Perilous Math: 24 Death-Defying Challenges for Young Mathematicians? How would you rate it?